"I'm really struggling with my marathon taper," said no one ever. Except me. This was not at all part of my plan. My mental plan was if I made it to the peak training mileage of a 20 mile long run, I was home free. In my mind I had crossed the finish line. Taper Shmaper. Cocky? Maybe. Naive. Yes ma'm. I hit all my big runs hard, like a girl with something to prove. I suppose that girl did have something to prove. I came so stinking close, but never crossed the finish line last year. Last year's longest 18 mile run just about killed me. See for yourself. Great improvement but I was running this new distance way too hard for a first time marathon girl. I knew better. Hindsight is 20/20. 1. Stick to the plan ALWAYS. I had prided myself on never missing one single workout ALL marathon training season on the exact day Mr Higdon recommends. I had zero flexibility in personalizing it to my unique body and circumstance. Until my body said, Um. Yea. No more. 2. Rest days are for babies. I crammed the mileage in no matter what. I once went out with my sister for dinner and drinks only to get home at 10pm and run my scheduled 10 miles until midnight that night. I remember telling my brother in law my plan and his reply was, "You're crazy." 5. Ignore the physical therapist because you're faster than he is. Well I get a pass on this. No physical therapist :) But to be honest I really didn't heed any advice that told me to slow down from more experienced athletes. Touche. 6. Switch shoe styles mid season. I continue losing weight in spite of every article pretty much saying you should be gaining weight. Time to tame the fears of my inner fat girl. 8. Cross training doesn't count. Never, ever did I account for cross training. 9. Pop out of a car or plane and do a hard workout as soon as possible. Guilty, but only of the car piece! Stressed out? I'm not sTreSseD!!$#! Everything came full circle this past week. Work deadlines, big business orders, kid's starting school, mommy of the year pursuit epic fail, oh yea and marathon training. Something had to give... And it did. Total burnout just when things should be getting easier. No fun. But the good news is I am not injured and I've learned some valuable lessons. And I am slowing down. Tomorrow's long run will be done slow. SSLLOOWW. I have taken the past 2 days to reflect. Just prior to my burn out, I had gotten a piece of wisdom from a couple G+ friends. After I hit 20 miles I wanted to know about the 6.2 miles after that. What is that like? For a first time marathoner, the first time you ever run 26.2 is the marathon day. That scared me. A lot. I wanted to know what the last 6.2 miles would feel like and how you get to the finish line. 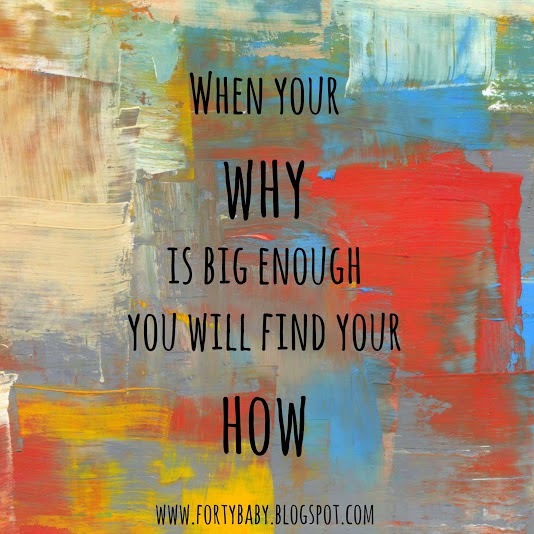 Ambition, visualization, and figuring out your "why." I always say that I have no idea why I want to cross the finish line of a marathon, I just know that I am meant to do it. On my 20 mile run I caught a glimpse of my why. 18 miles had been my furthest run of all time last year. When I got to 17 miles I was tired and fearful that I had to go 3 more miles. I thought back to my mom like I always do on my long runs. In life I used her to get to where I needed to be when I was afraid. If she were alive, I would call her and tell her how tired I was. This is how it would go. Me: Mom I'm so tired. I don't know how I am going to do all this. What if I don't make it? Mom: Darcey, honey. Why are you doing this? Take a break. Stop this nonsense. Why are you running so far anyway? Me: Mom. You don't understand. I need to do this for me. Me: Mom you never dared do anything for yourself like this before. Stop killing my dream. Yip. I was a mean, mean girl. And that was our dance. I never really had to face my own fears because I focused on hers, which were really mine too but at the time I don't think I knew it. Our dance gave me this bizarro and unhealthy strength to prove her wrong. She isn't here anymore to prove wrong and I have to find my own strength in the face of fear. So I cried while I was running when I thought of her and reached my furthest distance of 18 miles. I was exhausted mentally, emotionally and physically. "As he was about to climb yet another dune, his heart whispered, be aware of the place you are brought to tears. That's where I am and that's where your treasure is. " The Alchemist by Paulo Coelo. Thanks mom. Thanks for getting me back to 18 miles. But it's time for me to look forward now. I can't look back anymore and still move forward. I have to let go now. And with that I said goodbye for now, tucking my mom carefully in my heart. The thought of my mentor replaced my mom. She is the here and now, the epitome of strength and courage and all things I lack and want to be. All things I need to learn to be for my daughters. Thinking of her and my girls reminded me of my strength and it was the bridge that got me from mile 18 to mile 19. Shockingly, by mile 19 I thought of none of that. Mile 19 to 20 was just me, facing my fears alone and relying on my own strength for the first time in my life. Yes sadly, I say that at 42 years old. But better late than never. I am still afraid, but I think I'm just about ready to attempt to see the other side of 20 miles. The only thing I know for sure is that somewhere in those last 6.2 miles lies my strength, and it feels like it's time for me to try to find it. You sure do learn a lot about yourself when you train for a marathon.